Zynaptiq has just announced their new plug-in ADAPTIVERB, a harmonic tracking resynthesis reverb plug-in. 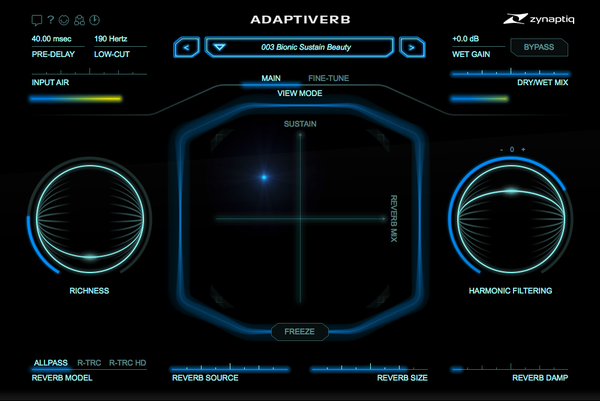 ADAPTIVERB is a revolutionary new, reflections-less reverb plugin. Unlike traditional reflection-based acoustic room modeling, ADAPTIVERB adds depth, harmonic richness, and butter-smooth tails without obscuring the source. Preserving the tonal definition and directness of your mix, it adds "size", "glue" and "body" – making it perfect for mixing and mastering applications alike. Harmonic Contour Filtering (HCF) circuit for removing effect components not in tune with the input, a captured harmonic fingerprint, or set of notes defined using an onscreen keyboard. Richness parameter for adding octave, fifth or unison interval harmonics into the reverb.! More than 400 presets covering a broad range of effects, including bread-and-butter reverbs, "invisible” reverbs, instrument-/voice-colored reverbs, cross-filtering, adaptively filtered delays, and pads/drones that play without input signal.